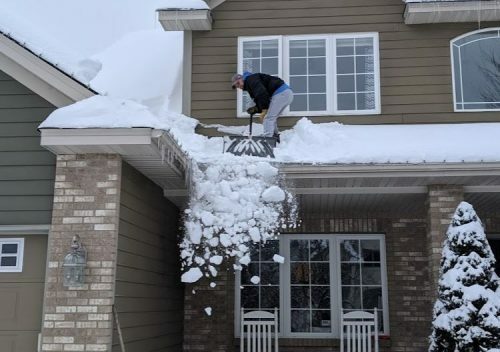 The record-setting snowfall that we've received here in Minnesota raises concerns about how much snow a roof can hold. Should you remove snow from your roof to prevent a collapse? I have good news for you; there's probably nothing to worry about. The required roof snow loads for Minnesota aren't clearly spelled out anywhere, but the numbers can be found by using Table R301.2(1) of the Minnesota Administrative Rules. 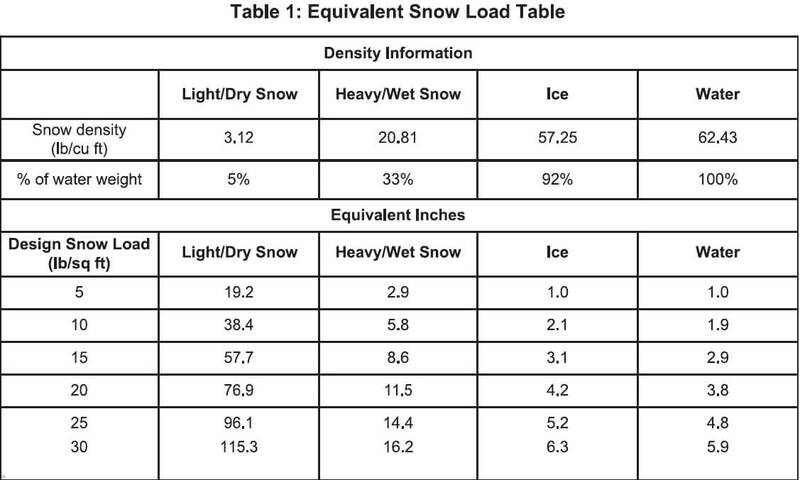 This table says that roof snow loads equal .7 times the ground snow load. To find the ground snow load, we use section 1303.1700 of the Minnesota Administrative Rules. The southern portion of Minnesota, which includes the Twin Cities metro area, uses a ground snow load of 50 pounds per square foot. The northern portion uses 60 pounds per square foot. For the Twin Cities metro area, the roof snow load equals 35 pounds per square foot, or .7 x 50. So how much snow does this equal? It depends. As everyone knows, cold fluffy snow is very light, while wet snow can be extremely heavy. 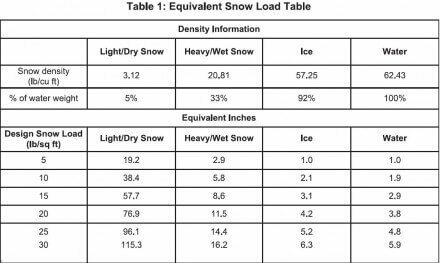 The chart below, courtesy of Paul Schimnowski, P.E., gives some examples of snow loads. 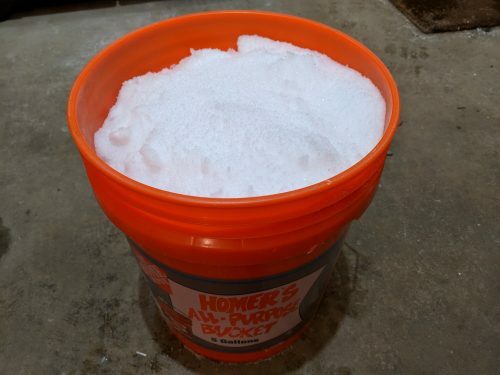 I weighed a section of undisturbed snow, using a 5-gallon bucket, which has a footprint of approximately 2/3 of a square foot. This weighed 9.5 lbs, so a full square foot would weigh less than 15 pounds, or 15 psf. If you have a properly constructed roof, you shouldn't have to worry about your roof collapsing. We're not even halfway there. Not only that, but snow on a sloped roof typically isn't as deep. Not only that, but snow drifts are the result of light, fluffy snow blowing around; not heavy wet snow. Not only that, but moisture evaporates from snow over time, making it lighter and lighter as time goes on. And finally, 35 pounds per square foot is a minimum requirement. If you have ice dams, however, removing the snow is the good thing to do. Use a roof rake or hire someone to do it professionally. DO NOT walk on your roof to remove snow. This is extremely dangerous. The person pictured above may or may not have fallen off of the roof right after I took this picture. When professional ice dam companies remove snow from roofs, they wear safety harnesses.